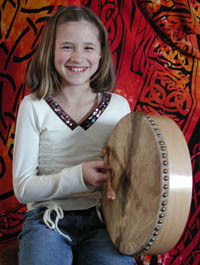 Bodhran, the heart beat of Celtic music presented by Mance Grady, one of the foremost players, makers, and teachers in North America. "I take great pride in my drums, and make each one as if I were making it for myself." "A lot has happened in the almost thirty years since I made my first bodhrán. In that time, I'd experimented with most everything, from different types to different thicknesses of skins, to experimenting with different skin treatments to various shell depths. It wasn't much later than when I made my Ultra Thin Bodhrán in 1979 that I determined to go the opposite route and make an Ultra Deep Bodhrán. It seemed like a good idea, but one that most weren't quite ready for -- and few requested. It's time has now come. A fitting compliment to the graceful lines of these rims with tapered cutout is our highly durable, textured Flex Comfort Edge. Another first from the Grady laboratories. Absolutely gorgeous. I'm also happy to say that I now have bags to accommodate these beauties." Made by a skilled Irish-American craftsman in America. Ace Bodhráns by Mance Grady are fashioned not through modern means of mass production, but by the time-honored workmanship of Mance Grady himself. No machine has yet been devised to equal the workmanship that Mance displays on his bodhráns. 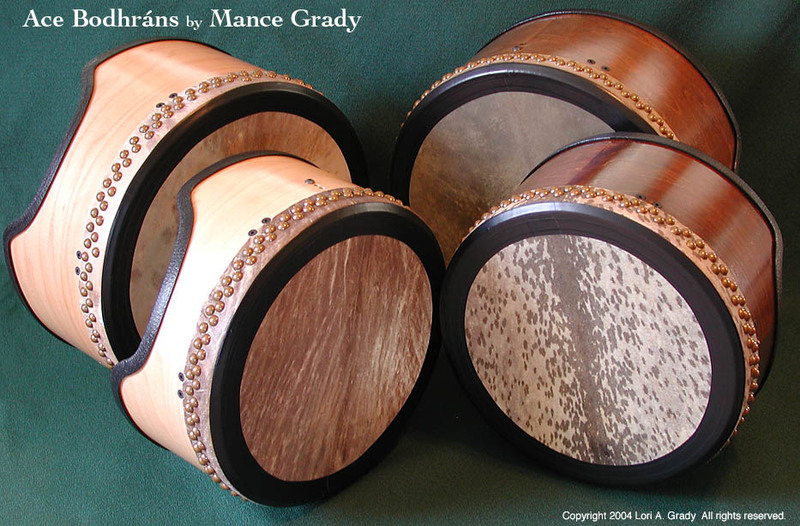 The famous Mance Grady bodhrán is the direct result of his knowledge, expertise, professional attitude, and literally years of always being in the forefront of the finest handmade Bodhráns available since 1975. The word "best" keeps repeating itself for a reason...because it is -- the Look, and the Tones you've only dreamed about. MG Comfort Edge -you saw it here first! Did you know? The Slide Bar is an invention of Mance Grady's - the result of Mance wanting to be able to quickly and securely access different parts of the skin while having the option to being able to exert extreme pressure on the skin in order to get those nice high tones. Some people have mistakenly referred it to something called a "Back Slide" which is sold by Lark in the Morning. The Mance Grady Slide Bar and the Back Slide are two completely different things. Finally, the ideal solution for those budget-minded of you who are just starting out playing the bodhrán and aren't sure if you're ready to invest in a professional model drum. 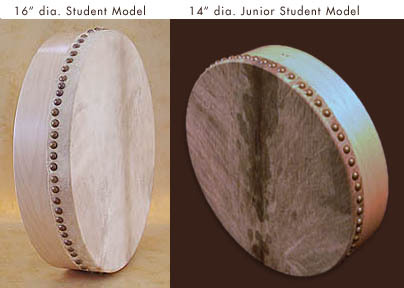 Mance Grady introduces a new model bodhrán for beginners - now in two diameters. 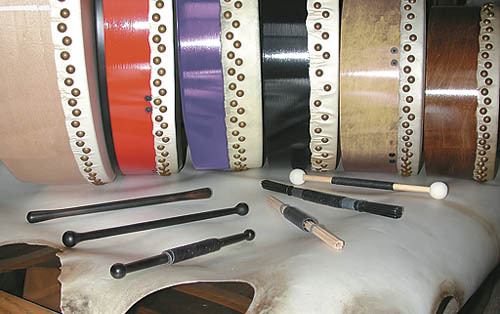 What you get is this: an affordable beginner's bodhrán which will give you the tonality and response of a professional quality bodhrán, unlike most of what's currently available from other maker's in the same price range. or you can have an open back. You can view Student Model Bodhráns currently in stock by clicking here. and are available in Natural finish only.